When people ask me “what is Tai Chi good for”, I say: to relax! Besides all the benefits, Tai Chi is really one of my favorite ways to relax. One other easy way to relax is: to laugh! 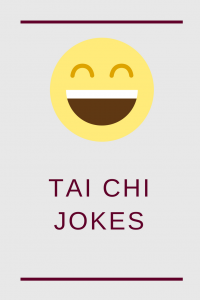 Thus I just had to find some Tai Chi jokes! How many taichi masters does it take to screw in a light bulb? 9. Actually, I was quite surprised how few Tai Chi jokes I could find! If you know one, feel free to leave a comment below! P.S. : If you want to have even more fun, have a look at these 15 fun Tai Chi videos! This entry was posted in Thoughts and tagged fun, mindset on 2017-12 by Angelika Fritz. Very good jokes…..I love dragon chikung and you ? In deutsch – Lachen ist die best medizin. …smile is the best medicine. …. I agree, laughing is the best way to relax! How many Tai Chi students does it take to change a lightbulb? 100. One to change the bulb, 99 to say “that’s not how they taught it at my school”. How many Taiji practitioners does it take to change a light bulb?